Pioneers in the industry, we offer steam condensing units from India. With the assistance of our team of professionals, we are engaged in providing an excellent quality Steam Condensing Units. Our offered condensing units are manufactured using high grade components and innovative technology. 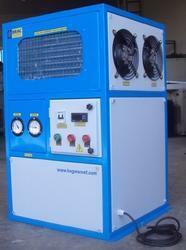 The provided condensing units are checked on varied parameters by our quality controllers. Furthermore, these condensing units can be availed at nominal prices by our customers. Looking for Steam Condensing Units ?